Paul LaRue, an award winning retired teacher from Washington Court House City Schools, presented the program recently at the Fayette County Genealogical Society meeting. Paul presented the story of our nation’s under appreciated African-American veterans of World War I. This program told of how even in the war to free the slaves, the African-American soldiers who fought were underappreciated in the Civil War as well. The black soldiers were not given the same medals as white soldiers, many were given private medals called the Butler and Gilmore medals that were not recognized by the government. Civil War veterans were entitled to pension, but 92 percent of white veterans, compared to 72 percent black veterans, received pensions. More white veterans received the civil war tomb stones than the black veterans, which were to be given to the veterans. One other benefit for Civil War veterans were the Soldiers Homes. These homes, something like rest homes or nursing homes, were to be available to veterans who were so injured they needed to be cared for or for those who had become so old and ill they had no place else to go. Any benefit that was available for the veterans of the Civil War was much more difficult for black veterans to receive than white veterans. 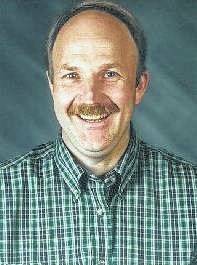 Paul LaRue is a retired social studies teacher from Washington Court House City Schools. During his 30-year career, he was the recipient of numerous state and national teaching awards. Paul is best known for his work of getting students out into the community using “hands on” history. Paul’s presentations at the Society are always well-attended and well-received. At the Society’s next meeting, our very own president Sue Gilmore will be presenting a program on how to turn your family history discoveries into cherished gifts for your family members. Sue will be demonstrating how to make photo family trees, photo collage pictures, photo books, magnets and coffee mugs. This meeting will take place Monday, April 15 at 7 p.m. in the meeting room of the Carnegie Public Library at 127 S. North St. in Washington Court House. Please enter the library on the Catholic Church side of the building. For further information concerning this meeting, the Society or membership, contact Cathy Massie White at 740-333-7227 or ReunionMassie@yahoo.com. https://www.recordherald.com/wp-content/uploads/sites/27/2019/04/web1_PaulLaRueHeadshot.jpgPaul LaRue, an award winning retired teacher from Washington Court House City Schools, presented the program recently at the Fayette County Genealogical Society meeting.